I’ve been looking for a place to watch college football in downtown San Jose all season, and I found some good choices, but I’m still not sure I found a really great sports bar. Today I watched the first half of the Cal-Washington game at Fourth Street Pizza, where you can get the classic football-watching combination of pizza and beer while watching the game on your choice on any of about a dozen screens. I saw the second half of today’s game at the brand-new (open 3 weeks) ClubHOUSE restaurant and “sports lounge”. This place has a lot of potential, with friendly staff, a hip (maybe too hip for me) atmosphere, and a few different items on the menu. The beer selection includes Belgian brews you don’t see everywhere and a scotch ale that took the edge off a disappointing game. The main issue with the place is that they have plenty of tables, and plenty of tv screens, but somehow very few of the seats seem to be placed to give good views of the screens. If you’re sitting at the bar there’s only one screen, positioned way down at one end of the bar, to watch. I saw the previous couple of weeks’ games at the San Jose Bar and Grill. Here, there’s a good beer selection, including Ranger from New Belgium Brewery, and the menu of sandwiches and burgers had some nice choices. If I were trying to save a buck, there were great special prices on chicken wings and Pabst Blue Ribbon beer during college football games this season—maybe they’ll be back next year. There’s good sightlines to 3 screens from pretty much anywhere at the bar. The bartenders were always friendly, but not intrusive. Earlier in the season, I took in a couple of games at the Brit, which had the best crowds of any of these locations. For three games I watched there, there were always at least a couple of other parties in the place, which is more than the other bars had. Usually there was a pack of 2-3 regulars at the bar trading jokes with the bartenders, which gave the place a friendly feel. Food here runs toward pub grub, including shepherd’s pie and fish & chips, as well as more regular American bar fare. 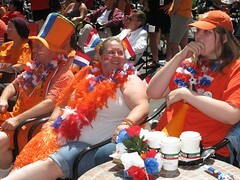 What all of these places lacked, including the Brit, is a real crowd of enthusiastic customers getting into the games. Even a crowd watching a different game from me would have been something. It’s hard to get really into a game if you’re cheers are going to be echoing across an empty bar, or getting you looks from people who’re just looking for a quiet lunch or drink. It might be different during a Sharks game or during Sunday football, but college football just doesn’t seem to be this town’s game. I know there are some options farther afield, like Double D’s in Los Gatos, or the Old Pro in Palo Alto, but I’d really like to find a place I can walk home from. I know I missed the Blue Chip on South First Street; but otherwise, where should I check out for an enthusiastic college sports crowd on a Saturday afternoon next season? As reported by Center Line Soccer, a mere two months after winning the championship of the Women’s Professional Soccer (WPS) league, San Jose’s FC Gold Pride will cease operations for financial reasons. The team’s private owners had sought a buyer for the club, but were unable to find anyone willing to support likely million-dollar-per-year losses. The team apparently lost about $5 million in the two years it played. The WPS is expected to announce the league will continue in the 2011 season, despite the loss of its top team. Keep an eye on Center Line Soccer for further details about the fate of the team and its players. Every Tuesday night something completely different happens at The California Billiard Club. Players and non players alike can choose a song title out of the book and then give the Karaoke a try. Two players, Don and Dan, put down their cues long enough to entertain the room. Today is the last double-header game of the 2010 season. The Silicon Valley Roller Girls will take on the Choice City Rebels of Northern Colorado and the Sac City Rollers’ Folsom Prison Bruisers. $13.00 @ Psycho Donuts in Campbell, Streetlight Records, Jack’s Bar & Lounge, and San Jose Skate. Okay, I can only speak for myself but as I stood on the corner of San Fernando and Autumn and looked at the proposed site of the San Jose Athletics ballpark I couldn’t help picturing myself walking through the main entrance of the ballpark on game day and I got pretty excited. and the corner (and hallowed ground if hallowed ground can be secular?) that I hope will one day be the home of a major league ball club. The planners envision extended mass transit such as high speed rail, public art, trails, retail shops, restaurants and clubs. The beautiful artist’s renderings of the proposed ballpark made it easy to imagine this vision coming true. You can go to Pro Baseball San Jose for more details and links to the ballpark plans. 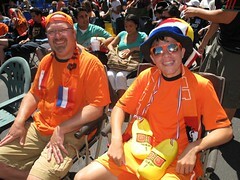 Final score, Netherlands 0, Spain 1, and Spain will be world champions for the next four years. Bring the A’s to San Jose! 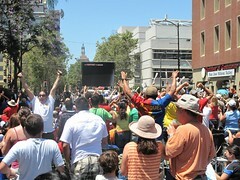 I would welcome with much enthusiasm a ball team here in San Jose. The timing is perfect. The A’s are in need of a new home, and there are many reasons to build them a stadium here. We have a strong fan base, our weather (won’t need to wear a coat), jobs would be created, not to mention the tax revenue benefits our city would enjoy. All this, and no more long drives up and back on Hwy. 880! Just imagine family fun and tailgate parties close to home. The San Jose City Council will be considering the Environmental Impact Report on a downtown site. Take this opportunity to let the City Council know that we mean business! Gather up your family, friends, and neighbors to attend the City Council meeting. * Pro Baseball for San Jose, Inc.
Riders in the 2009 Tour of California. 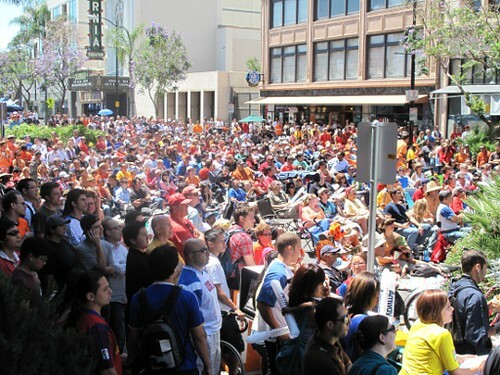 The Amgen Tour of California cycling race returns to San Jose for the fifth straight year tomorrow. Racers will start out from downtown San Jose at 11 am and follow a 120-mile route via Livermore to Modesto. This will be the fourth stage of this year’s tour. In today’s stage from San Francisco to Santa Cruz, David Zabriskie, Michael Rodgers, and Levi Leipheimer, the podium finishers in the 2009 tour, made a breakaway and finished 1-2-3 in the stage. Other stars in the race include Lance Armstrong (I’ll assume you’ve heard of him), 14-time Tour de France rider George Hincapie, world road cycling champion Tom Boonen, and Olympic champion Fabian Cancellara. A map of tomorrow’s stage is available at the Tour website. What has 1600 wheels, 1600 feet, swims through Uvas Reservoir and feasts on burritos and beer? The 800 triathletes who are signed up for the 19th Annual Morgan Hill Sprint Triathlon! At 7am Sunday, while most people are still snuggled under the covers, 800 athletes plus numerous volunteers will already be lined up at Uvas, with bikes racked and running shoes set out carefully on towels. Participants will swim ¾ mile in the reservoir, get on bikes for a 16 mile ride, then take off running for another five miles. Do you have what it takes? I’m not sure if I do, but I’ll be there lined up in my wetsuit, too. The Morgan Hill Sprint Triathlon is USAT sanctioned and follows a beautiful, mostly flat course. Athletes and volunteers return year after year to participate in and support this fast growing sport. The post race party includes burritos and beer and more!! If you don’t feel ready to participate or volunteer, feel free to come by and spectate! It is hard not to catch the triathlon bug when watching your first race. Don’t be surprised if you decide to hop on your bike Monday and make plans for next year! Visit the website for more information on the course, parking, volunteering and signing up! Check back here next week for a write-up of my experience… if I survive!